Cats, like children, can get into all sorts of things. While sometimes a cat going somewhere they shouldn’t can be harmless, other times it could be detrimental to their health. Cats’ eyes can be super sensitive, for example, and can be subject to a wide variety of concerns, and excessive blinking could be a sign of something even larger than originally anticipated. If your cat is exposed to something infectious, it could cause a large problem. For example, a runny eye could be a symptom of dust or allergies or a sign of some types of feline herpes or chlamydia that could be culprits of your cat’s eye infection. If your younger cat has a weaker immune system, he or she could be especially prone to eye infections. If your cat is a bit older, an eye infection could be a sign of a more serious age-related problem. It is important for you as the owner to identify any irregular behavior as soon as possible. 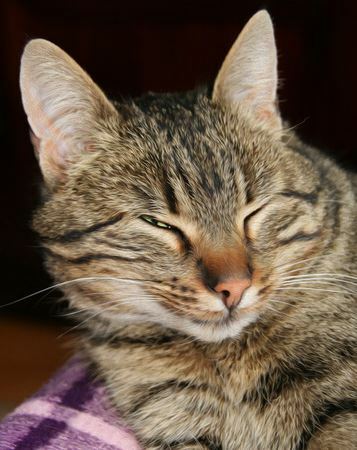 If your cat starts rubbing at his or her eye more frequently, chances are something is bothering them. However, if your cat regularly has tear-stained fur, there’s probably nothing to worry about. Just be sure to note if your cat is acting irregular. Regularly wiping your cat’s face with a damp cloth to remove eye gunk and wiping clean the fur around the eyes can help to reduce the risk for eye problems, as can keeping the hair trimmed around your cat’s eyes – especially true with long-hair cats. If you suspect your cat has an eye problem, schedule an appointment with your veterinarian to get an accurate diagnosis. If your cat’s eye infection is an uncomplicated infection, chances are there will be a relatively easy recovery. Bacterial infections respond well to antibiotics and viral infections usually will go away with time. Bacterial infections will usually require some sort of ointment or eye drops to treat. However, if the infection is a symptom of another problem, your veterinarian may want some tests run. The best way to prevent eye infections is to schedule regular checkups with your veterinarian. For at home prevention, we recommend identifying any irregular behavior. If your cat is favoring his eye, take action and get it checked out. It’s always better to be safe rather than sorry. At The Cat’s Inn, we know that your cat is special. Our different types of cat condos and townhouses are purr-fect for your feline friend when he is in recovery from an eye infection or for helping keep cats separated and secure at your animal shelter or veterinary practice. For more information on our townhouses and condos, give us a call at 877-288-7466 today.